The University of Chicago’s first statue soleley honoring a woman was unveiled on Tuesday in a ceremony at Mandel Hall. 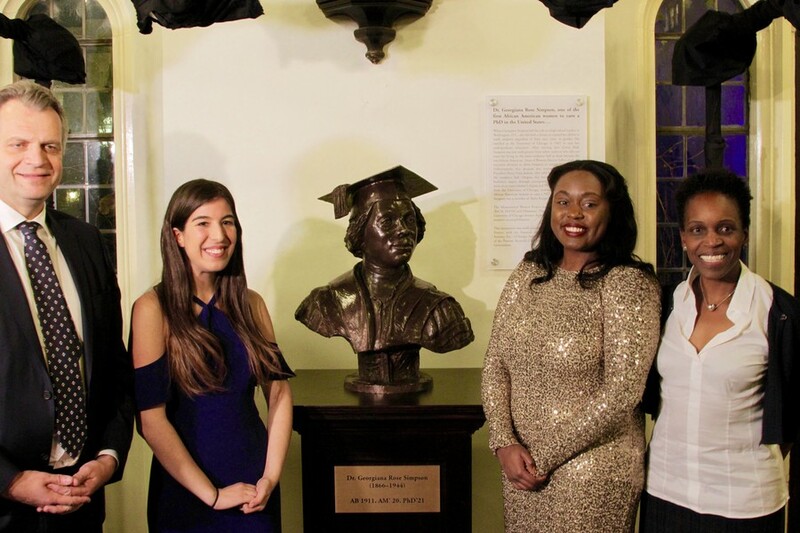 The bust memorializes Dr. Georgiana Rose Simpson (A.B. 1911, Ph.D. 1921), a scholar of German language and literature who was one of the first African American women to earn a Ph.D. in the United States. It was commissioned by the Monumental Women Project (MWP), a group founded by fourth-years Asya Akca and Shae Omonijo. The project cost nearly $50,000 and was funded through private donations and grants, including a $9,500 grant from the Uncommon Fund. Omonijo and Akca say they hope that Simpson’s bust will help underrepresented students feel welcome in the University community. Simpson overcame substantial racism to win her degrees. As an undergraduate at the University, white students protested her presence in campus housing. Although the dean of women, Marion Talbot, and the head of Simpson’s dorm, Sophonisba Breckinridge, affirmed Simpson’s right to live on campus, then-President Harry Pratt Judson overturned their decision and forced Simpson to leave campus. Simpson was not deterred. Through a combination of summer and correspondence courses, she managed to complete her bachelor’s degree in 1911. She later returned to the University to complete a doctoral degree in German philology. Simpson’s bust now stands in the Reynolds Club, which was once home to spaces reserved only for men. She faces a bronze relief of Judson, the man who barred her from campus housing. Referencing the tradition that students must not touch the Reynolds Club seal, Omonijo and Akca asked the University community to start a new tradition of reaching out to Simpson’s statue for luck. “Students can touch Dr. Georgiana Simpson’s bronze tassel as a form of reassurance that not only will they graduate, but they’ll survive and thrive,” Omonijo said. University speakers at the event included Provost Daniel Diermeier, Vice Provost for Academic Leadership, Advancement, and Diversity Melissa Gilliam, and Assistant Dean of Students Sarah Cunningham. The speakers praised the Monumental Women Project and Simpson’s legacy. The faces of white men line the walls at the University of Chicago. Today, a black woman joins the ranks. Dr. Georgiana Simpson was one of the first African American women to receive a PhD in the US. Preston Jackson, the sculptor who created the bust, also spoke in tribute to Simpson’s legacy. Jackson is a Chicago-based sculptor and professor emeritus at the Art Institute of Chicago who is known for his bronze sculptures of people of color. “It’s an honor to be here and to be a part of this,” he said. Loann Honesty King, a historian from Alpha Kappa Alpha Sorority, also spoke. Simpson joined the Beta chapter of Alpha Kappa Alpha as a graduate student. Simpson never married and had no children. However, the approximately 30 Alpha Kappa Alpha women in attendance claimed her as one of their own. “You all are her family,” Omonijo told them. The women, including former U.S. Senator Carol Mosely Braun, cheered. “Dr. Simpson represents the epitome of an Alpha Kappa Alpha woman,” King said. Finally, Akca and Omonijo--the latter of whom was in tears--took to the stage one last time to announce the unveiling of the statue outside Mandel Hall. A chamber music quartet began playing, the curtain in front of the bust dropped, and Simpson’s face was revealed. Uncommon Fund winning project to install bronze bust of female professor to commemorate her achievements.